TUCSON, Ariz.— The U.S. Department of Agriculture’s Wildlife Services, which has dramatically ramped up its notorious wildlife-killing campaign across the United States, is the recipient of the Center for Biological Diversity’s 2014 Rubber Dodo Award, given annually to those who have done the most to drive species extinct. The program killed more than 2 million native animals in 2013, a 30 percent increase over the previous year. The tally of the dead included 320 gray wolves, 75,000 coyotes, 419 black bears and scores of other animals. Previous Rubber Dodo winners include the Koch brothers (2013), climate denier James Inhofe (2012), the U.S. Chamber of Commerce (2011), former BP CEO Tony Hayward (2010), massive land speculator Michael Winer (2009), Alaska Gov. Sarah Palin (2008) and Interior Secretary Dirk Kempthorne (2007). Most of Wildlife Services’ killing is done on behalf of the livestock and agriculture industries, along with other powerful interests. The methods are gruesome, including aerial gunning, traps and exploding cyanide caps. Pets have also been inadvertently harmed. 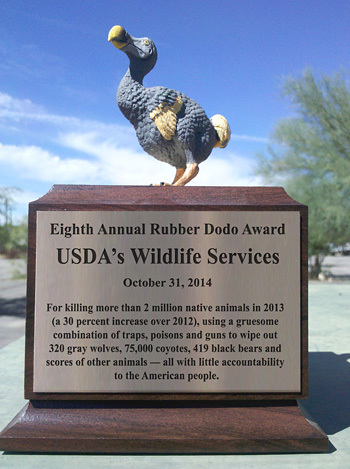 More than 12,500 people cast their votes in this year’s Rubber Dodo contest. Other official nominees were Rep. Doc Hastings, who has pushed to erode the Endangered Species Act; pesticide maker Monsanto; and notorious Nevada rancher Cliven Bundy. In 1598, Dutch sailors landing on the Indian Ocean island of Mauritius discovered a flightless, three-foot-tall, extraordinarily friendly bird. Its original scientific name was Didus ineptus. (Contemporary scientists use the less defamatory Raphus cucullatus.) To the rest of the world, it’s the dodo — possibly the most famous extinct species on Earth after the dinosaurs. It evolved over millions of years with no natural predators and eventually lost the ability to fly, becoming a land-based consumer of fruits, nuts and berries. Having never known predators, it showed no fear of humans or the menagerie of animals accompanying them to Mauritius.